Yeoh Li Tian continues to edge his way up to passing the magical 2500 mark but there is no one else remotely close to his level. His predecessor as undisputed Malaysian No. 1, Mas Hafizulhelmi, has been at this 2300+ level for sometime now while juggling work and family commitments and so is not likely to turn back the clock. Yet he remains easily a permanent and valuable member of national teams. Young players have been long on the rise but the jury is still out as to whether they will be able to make the jump and of these, National Champion Wong Yinn Long has most impressed. Perhaps this year might be the chance for several senior players who have narrowly missed out on national team selection and given the unprecedented shameful 134th placing at the Baku Olympaid two years ago, it is unlikely there will be tampering in the qualification process again. Our No. 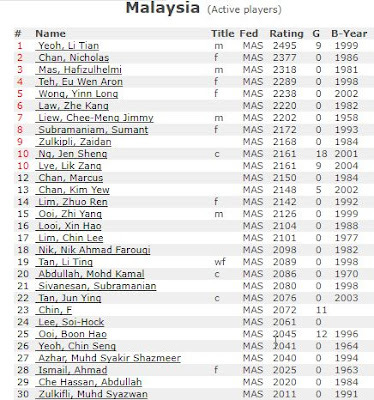 1 girl is Tan Li Ting and she is also ranked 19th amongst the men (more correctly is perhaps to call it the combined list) and the gap between her and a resurgent Alia Anin Azwa Bakri is almost 100 points! National teams have always had the top four playing when all available and while not likely to change, the competition for the fifth spot is now very intense and that might also shake up the rest of the regulars who have practically taken their places for granted.